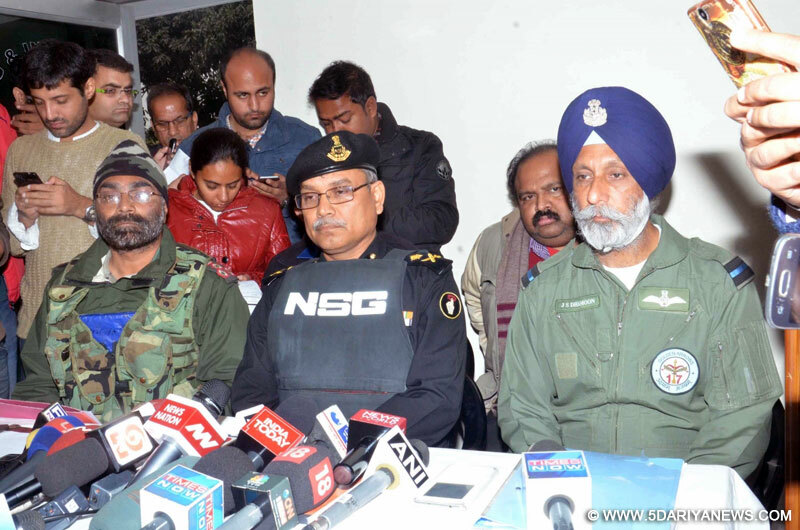 Pathankot: Inspector General, NSG, Major General Dushyant Singh and Air Officer Commodore (AOC) JS Dhamoon address a press conference regarding their operations against militants at Indian Air Force base in Pathankot on Jan 4, 2016. Over 62 hours after suspected Pakistani terrorists raided the IAF base here killing seven security personnel and losing five of their own, senior officers said on Monday evening that they were still sensitizing the area for possible hidden attackers. "The operations are still going on. We have been able to eliminate the fifth terrorist. Combing and search operations continue," Inspector General Major Gen Dushant Singh of the NSG told the media in the evening.He said that security forces comprising NSG, the army, air force with its air and ground assets, police and intelligence agencies were working in sync to make the operation successful. "All the assets of the air base, including personnel and families, have been secured and are safe," he said. "Given the magnitude of the base, the operations will continue till we are able to fully render it safe." The terrorists infiltrated the Indian Air Force (IAF) base in Pathankot before dawn on Saturday, leading to fierce gun battles with security forces. Four terrorists died on Saturday after 15 hours of fighting.Seven security personnel, including an officer of the National Security Guards (NSG), an IAF Garud commando and five Defence Services Corps (DSC) personnel, were killed by the terrorists.The United Jehad Council (UJC), an umbrella grouping of Kashmiri militant groups based in Pakistan, on Monday claimed responsibility for the attack.The UJC, led by Syed Salahuddin, said the raid "was carried out by the national highway squad of the UJC".The Dawn, a leading a Pakistani newspaper, on Monday urged Islamabad to act if it was proved that Pakistanis were involved in the terror attack.Search and combing operations continued even on Monday evening, the third day of the attack. Security forces moved to secure every inch of the air base. Occasional sound of firing and a blast was heard from inside earlier when it was suspected that two terrorists were still holed up.Brigadier Anupinder Singh of the army said the terrorists were holed up in a double-storeyed building, a living accommodation of the IAF personnel. "The operations are on to clear this building." Officers said the terrorists were well prepared and heavily armed and wanted to target strategic assets of the IAF at the base where a MIG-21 Bison fighter squadron and MI-35 attack helicopters are stationed.A search was also on in nearby villages for possible terrorists. Punjab Police on Monday arrested three men linked to smuggling gangs and recovered sophisticated weapons with Pakistani and Chinese markings from them.NSG and army commandos conducted a thorough mopping of the entire area where the terrorists, suspected to be from Pakistan and trained by the outlawed Jaish-e-Muhammed (JeM) outfit, had been cornered, police said.IAF helicopters flew through the night over the base.Twenty security personnel, including 12 from the NSG and eight from the IAF, have been injured. A grievously injured securityman was flown to Chandigarh.On Monday, those killed by the terrorists were cremated with military honours.Thousands paid tributes to NSG commando Lt. Col. Niranjan E.K. at his residence in Bommasandra in Bengaluru.IAF Garud commando Gursewak Singh was cremated with military honours on Monday in his village Garnala in Haryana's Ambala district. Hundreds thronged the venue. Gursewak Singh, 25, was killed on Saturday. The commando had got married only about 45 days back. "I am proud of my son. He has laid down his life for the country," said Gursewak's father Sucha Singh, a former soldier.In Punjab's Gurdaspur district, international-level shooting champion Subedar Major Fateh Singh was cremated with military honours. Breaking tradition, his daughter led the coffin bearers. "I am proud of my father. He was a very brave man. Everyone should get a father like him," she said.Punjab Chief Minister Parkash Singh Badal visited the families of Fateh Singh and Havildar Kulwant Singh in their native villages Jhandewal Khurd and Chak Sharif in Gurdaspur district.The Punjab government urged New Delhi to accord "sensitive" status to areas along the international border with Pakistan in view of the recent attacks by Pakistani terrorists.